A yellow daylily oil painting, final touches in this oil painting demonstration. 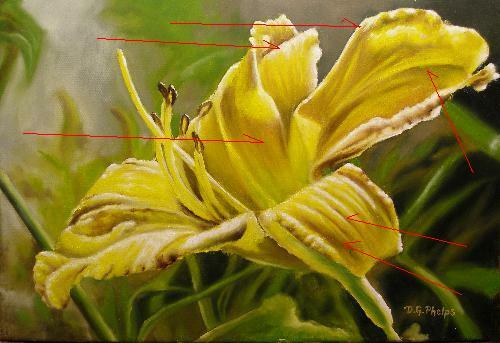 The Yellow Daylily oil painting demonstration completion. 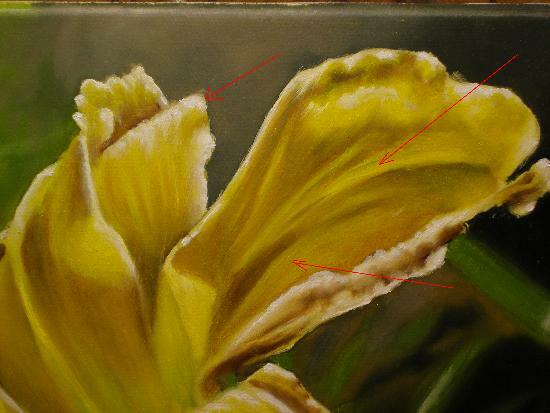 Somehow, this wonderful part of my alla prima yellow daylily oil painting demonstration was inadvertently deleted from the site for a week or so. My apologies to those who have been trying to find it. Hopefully, it won't disappear again! After allowing the paint to dry for a few weeks, I was unhappy with the contrast overall in the work. In the alla prima technique shown earlier, this (at least for me) is difficult to achieve. With a layering process, I seem to be able to get a much better value range by coming back to a painting and "glazing down the darks" and "scumbling up the highlights". 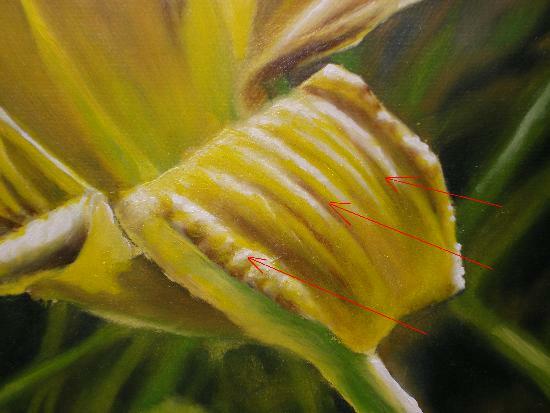 Lets start by looking close at my reference photo for the yellow daylily oil painting. And now, lets compare it too my finished Alla Prima painting of it. It just doesn't have the intensity and the punch as the reference, does it? I'll try to fix it, but honostly, I don't think I can, you be the judge and if you agree or like the completion, then use your facebook like button and comment on the piece. I've got tough skin! The areas where you see the arrows have had either highlights added or a glazing of yellow ochre or burnt umber. These glazes darken the area without wiping out the details behind them. They also deepen the color some. Here is another closeup of the oil painting demonstration with area's that were touched up with highlights or glazes. Another photo of areas that I decided to touch up. The beauty too behind this (oils in general) if I don't like it, I wipe it! With a soft lint free rag, to remove what I just painted. Since the underlying coat is dry, the original paint film is not disturbed. Hopefully, you can see a difference in the original oil painting and the re-worked version. I sometimes have to remind myself that at some point I need to stop work on a painting, this is usually just after these highlights are put in. Otherwise, my perfectionist side comes out and wants to fiddle again and again. When this happens, rarely does the reworked come out much better. But I think in this case, it did. 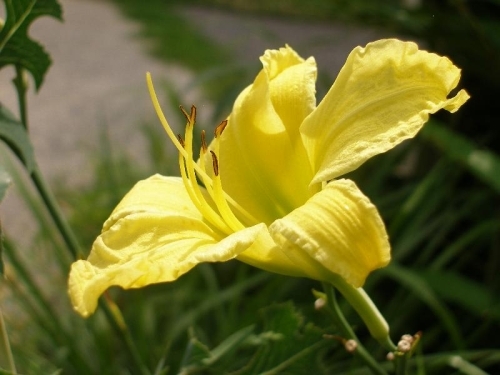 Head up to the top of our daylily oil painting demonstration page. 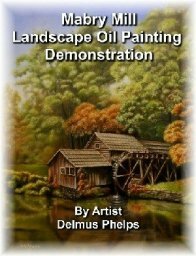 Head back to our oil painting lessons page. 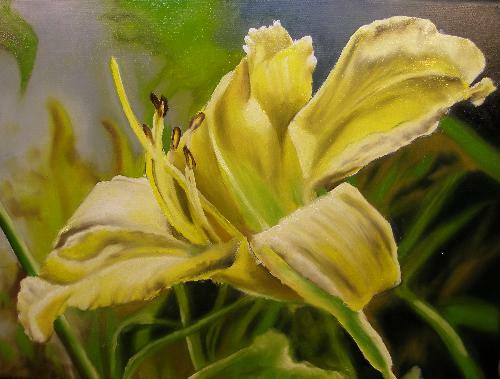 This concludes this series on an Alla Prima painting of the yellow day lily. Yes, I did spell it right this time. Seems my editor fell asleep on the first few pages, and I'll need to do some better spell checks. Try the alla prima method with a small painting, and see how it goes with you. If you don't like the results, well, re-work it like I did here! You just can't call it Alla Prima anymore!